I did this nail a few months ago, again just trying to work out how to work with gels and to nail down the french application when it comes to sculpting nails. 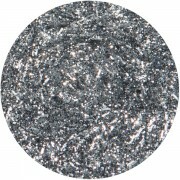 This nail is all Light Elegance gel products. 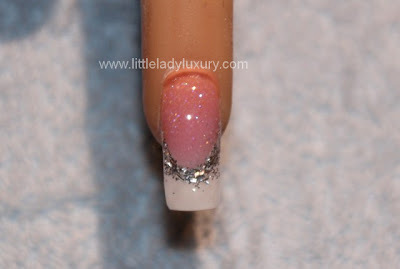 I hand mixed in glitter to the pink gel builder to do the nail bed. I then used the white builder for the tip and added on "Icicles" glitter gel around the smile line. Icicles is sort of a confetti glitter style, and i wish i had used something with smaller particles in order to make it blend better, but it was still a good first try. That's what practice is all about isn't it? So you haven't been seeing many posts from me. Life has pretty much exploded, but in a very good way. I've only been off my ship for less than 2 weeks, and I'm one week away from going back out to sea. Its been a whirlwind of trying to spend time with my boyfriends, family and friends as well as moving the rest of my belongings from Florida to our new apartment in Pennsylvania. And yes, for the record, I'm moving in with my boyfriend and that's a brand new experience too. So life has been crazy, but good :) Hopefully once things have settled I'll have some time to get some more posts up... maybe not new work by me, but at least some new featured artists.